SOCAR Polymer is hereby announcing the launch of the application process for the summer of 2019. The interns will be stationed in the SOCAR Polymer company’s production or office facilities of the PP and HDPE plants in Sumgayit city. 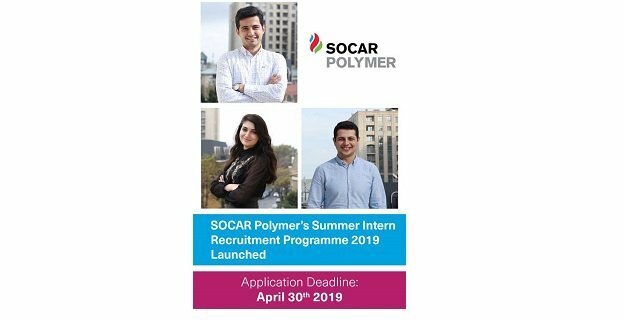 An internship in SOCAR Polymer is more than just a great way to get a better idea of the company - it’s a thrilling and rewarding opportunity to gain skills and experience, and to expose oneself to some of the incredible work the company performs. SOCAR Polymer, in its turn, will create broad opportunities for new and efficient specialists to support their future professional development. The programme stretches over an 8 weeks’ period during which interns will gain real work experience as part of a specialist team. Interns will spend eight weeks learning about the company and its activities, contributing to the ongoing projects, and gaining new knowledge and skills through research and first-hand experience. Interns will start off with a full induction, following which they will join a team working on an actual project. Most of the learning will come through on-the-job experience, although we’ll provide plenty of soft skills training as well. There’ll be learning sessions, including fieldwork for technical job interns, and lots of opportunities to meet, and get expert insights from, the professional staff. The chance to gain some insight. Implied is insight into the essence of the company, its role and the staff. Interns find out if they feel in place as potential graduate employees. The chance to get involved. Interns get interested and challenged with important work on live projects. It’s the best way to gain experience, and the best way to see if the work suits them. The chance to earn more than just experience. Industrial placements and Summer internships both offer a salary and paid holiday. The opportunity to progress. There’ll be plenty of support and training, to help interns perform to their best. Interns with impressive performance might get offered a graduate role. In such cases, they’ll go back to school and work with our company on the part-time basis. The Programme is envisaged for students pursuing education pertaining to engineering, IT systems, procurement, project controls, audit, finance, accounting, HR, Public Relations, logistics and law. Internships are open to applicants, who are in good academic standing, have a good command of written and spoken English, and are presently completing their last year of Bachelor level education, or are at any point of Master level education. Interns are invited to apply to the programme field(s) that best suits their career aspirations.